Williams Tanker Services was formed in 1988 and over the last 30 years we have grown from a small tanker workshop to become one of the largest and most prominent tanker service companies in the UK. We now have 3 modern large workshops on our Morley (West Yorkshire) site, each dedicated to their own specialism, a 7-bay tanker refurbishment & remounting workshop, a 5 bay tanker repair workshop and a 5 bay mechanic / running gear workshop. Combined with our own Stores department with a huge stock of parts we have the skillset, infrastucture, expertise and enthusiasm to deserve our reputation of being the most respected tanker workshop in the UK. We repair and refurbish all tanker types, however we do specialise in ADR equipment, including fuel, general pupose, bitumen, gas and cryogenic tankers. We have the experience, equipment, safety measures, AIB relationhips and legal understanding to offer a thorough yet quick turnaround on the most complex tankers on the road. 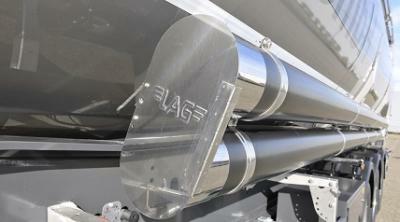 Since 2003 Williams Tanker Services have been the UK distributor for LAG. LAG are one of Europe's leading premium tanker manufacturers, delivering top quality new tankers across Europe for over 70 years. Selling fuel, ADR chemical, non-hazardous, tipping powder and non-tip powder tankers, LAG are sure to satisfy. Backed by the WTS workshops and WTS support staff offering our expertise from the point of enquiry, all the way to selling parts and offering technical advice once your tanker is on the road, we aim to act as your tanker partner, rather than a one-off supplier. We also have a range of second hand tankers and trucks available to sell and are always interested in purchasing second hand tankers and trucks, including trading-in second hand equipment against the purchase of new. So whether you are looking for a new tanker or something older, we should always be your first call. In August 2016 WTS were fully acquired by TIP Tanker Servces, Europe's leading tanker service company. Probably most well known as a rental and leasing business TIP over the last ten years have become a market leading tanker and trailer maintenance provider - becoming a high quality 'one-stop-shop' for our customers. The acquisition of WTS has been the perfect marriage for both business'. It has enabled TIP to enter new product and service markets whilst adding great specialist expertise into the TIP business. WTS has certainly gained from increased investment, but also the addition of new management and new systems. All this ensuring that our customers have the same safe pair of hands that WTS has always offered but doing things slicker and smarter than ever.